Just three crops – wheat, corn and rice – make up nearly 60 percent of the plant-based calories in most diets, according to a new report. Above, a farmer inspects a stunted cob in his dry maize field on March 13, 2019, in Zimbabwe. Why would a wildlife conservation organization be involved in a campaign to push people to diversify their diets? As it turns out, the way we humans eat is very much linked to preserving wildlife – and many other issues. 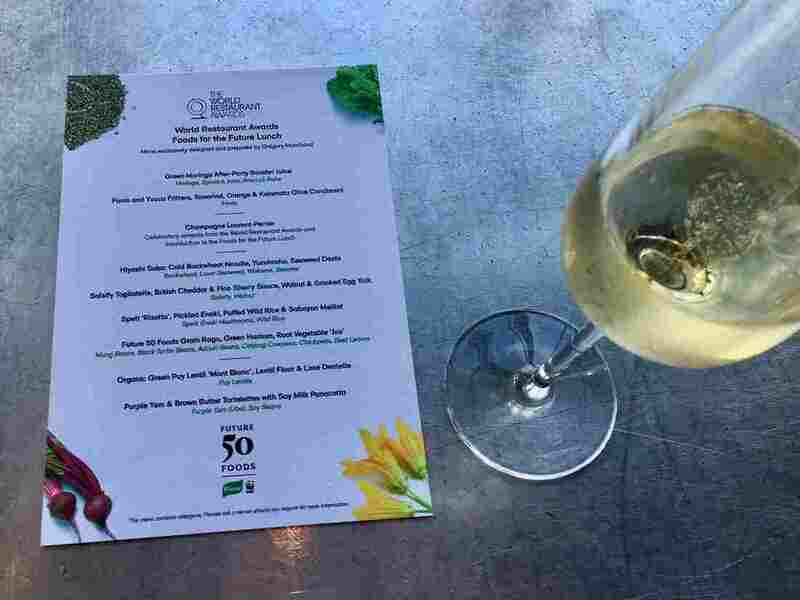 This was the topic at a recent conference in Paris where the World Wildlife Fund and Knorr foods teamed up to launch their campaign and report entitled "Future 50 Foods for healthy people and a healthy planet." The WWF's David Edwards says there has has a 60 percent decline in wildlife populations since 1970, and working to protect animals is no longer enough to save them. According to the report, 75 percent of the food we consume comes from just 12 plant sources and five animal sources. And just three crops – wheat, corn and rice – make up almost 60 percent of the plant-based calories in most diets. The lack of variety in agriculture is both bad for nature and a threat to food security, the report says . It argues that it's essential we change our eating habits to protect the planet and ensure we are able to feed the growing global population. The report says repeatedly harvesting the same crop on the same land depletes nutrients in the soil, leading to intensive use of fertilizers and pesticides that, when misused, can hurt wildlife and damage the environment. It pushes protein-rich plants-based foods that can be eaten in addition to or instead of meat. Red meat production in particular requires much more water and land than plants and produces significant greenhouse gas emissions, and it's a driver of deforestation. The staggering wildlife loss in the last 50 years includes the precipitous decline in insect populations – often referred to as as the insect Armageddon. "Nature can not continue to take this pressure," says Edwards. "The food system has pushed wildlife to the extremes." 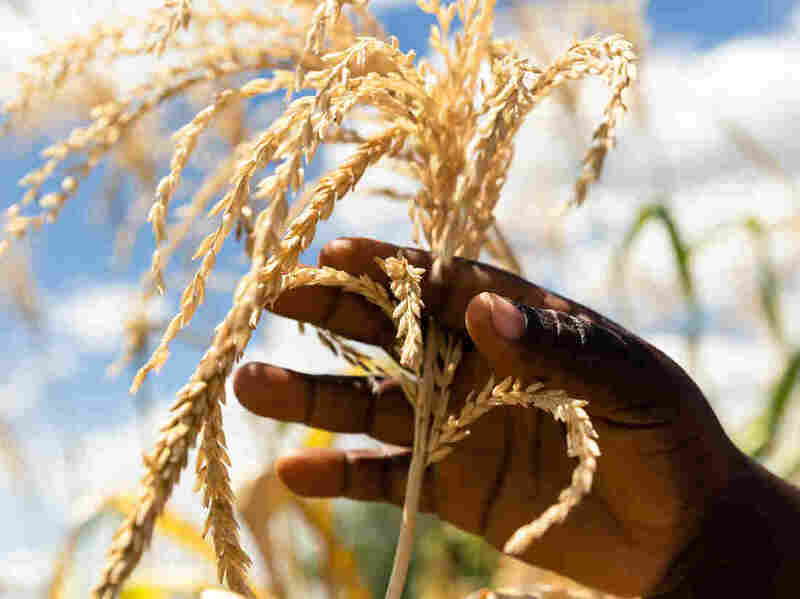 "It's a grain that's great for the planet," says Thiam. "And it's gluten-free, it's drought-resistant, it grows in two months, it scores low on the glycemic index, so it's great for your health too." Thiam says many of the items on the "future foods "list are from Africa, which also has 60 percent of the world's arable land. But he says in recent decades, multinational food companies have been pushing Africans to import foods from the West, like bouillon cubes. Thiam says farmers are the backbone of the African economy and boosting their ability to make a living would lift up the entire continent. The campaign's 50 foods were selected for their high nutritional value, low environmental impact, flavor, accessibility and affordability. Besides grains like fonio, they include various mushrooms, beans and pulses, nuts, tubers, algae and cacti. Many of the food crops the report recommends having higher yields than the crops we currently rely on, and several are tolerant of challenging weather and environmental conditions, meaning they could not only reduce the land required for crops, but also prove invaluable in the face of growing climate uncertainty. Chef Francois Roche's menu for a "Foods for the Future" luncheon included tagliatelle with British cheddar and sherry sauce, walnuts and smoked egg yolk . Chef Francois Roche's menu for a "Foods for the Future" luncheon included tagliatelle with British cheddar and sherry sauce, walnuts and smoked egg yolk. Tshiqi Bongiwe is a magazine editor from South Africa. She's stunned by the wonderful tastes of all the plants. "This whole idea of ​​diversifying our diets is very interesting from our perspective, because we come from a very staple, starch-and-meat type of environment in South Africa," she says. Wheat and maize are the biggies for us. So learning what we can replace them with is amazing. " You might expect global food conglomerates to resist such a diversity push. But Dorothy Shaver, who is head of sustainability for Knorr, says the company wants to be part of this move She says the shift in the amount and types of food people eat is inevitable and will also open new markets. "This actually gives us a major opportunity to identify some of the flavors that people are missing out on," she says. . "And then we can get them on people's plates. We can get people to switch out one of their white potatoes that they eat potentially four or five times a week with a purple yam. Or in Indonesia make it an Indonesian sweet potato instead of white rice. " Sam Kass was White House chef under President Barack Obama and directed first lady Michelle Obama's "Let's Move" campaign. Kass says with one in three American kids now headed for obesity, a push to diversify our diets – with a greater focus on plant-based foods – is exactly what's needed. "What's exciting about this is some of the biggest issues we face – climate change and human health – are coming together and the solutions are deeply aligned, "he says." What's good for us is also better for the planet. " Kass says consumers can just as easily drive t he solutions as the problems. And do not worry if you're not familiar with foods like fonio or salsify root. You can start by cutting back on meat and eating more beans. "Any bean," says Kass. "You can not go wrong. Black beans, door beans … they could not be better for you and they are as sustainable as any other product."